Buhari, Osinbajo, others honour fallen heroes amidst tight security – Royal Times of Nigeria. 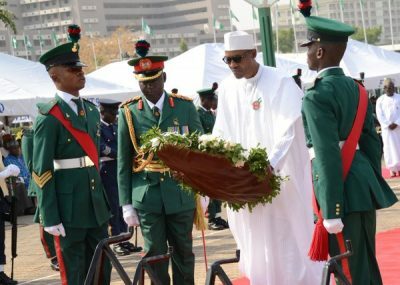 The grand finale of the 2018 Armed Forces Remembrance Ceremony was held in Abuja on Monday amidst tight security. President Muhammadu Buhari; Vice-President Yemi Osinbajo; President of the Senate, Bukola Saraki; Speaker of the House of Representatives, Yakubu Dogara; Chief Justice of Nigeria, Justice Walter Onnoghen; and the nation’s service chiefs were among dignitaries that attended the strictly military event. The event that lasted about an hour was held at the National Arcade, opposite the Eagle Square, Three Arms Zone, Abuja. The road leading to the Federal Secretariat was shut to traffic throughout the duration of the programme that saw Buhari and some of the dignitaries laying wreaths in honour of the fallen heroes. On arrival at the arcade, the President inspected a military parade before proceeding to lay a wreath in honour of the fallen heroes. Others who laid wreaths at the ceremony included Osinbajo, Saraki, Dogara, Onnoghen; Minister of Defence, Mansur Dan-Ali; Minister of the Federal Capital Territory, Muhammed Bello; service chiefs and the Inspector-General of Police, representative of the diplomatic corps; representative of the fallen soldiers’ widows and a representative of the Nigerian Legion. The event also witnessed a minute silence for the fallen heroes, a 21-gun salute, the release of pigeons to signify peace and the signing of the anniversary register by the President. Buhari had on November 1, 2017 inaugurated the anniversary emblem and appeal fund with a call on Nigerians not to allow the country to witness another civil war by their actions and inactions. He said the step was necessary considering the immense human capital loss of past civil war. The President had said it was worthwhile to honour the memory of veterans who paid the supreme sacrifice to keep the country united. He said, “The resolve by our countrymen and women to remain in one indivisible and indissoluble nation, Nigeria is at the centre of this celebration. “Indeed, the Remembrance Day Celebration is being marked on the 15th of January instead of 11th of November as in other Commonwealth nations to commemorate the end of the Nigerian civil war – a war that was fought to keep Nigeria one. Buhari had commended men of the Armed Forces for their courage and sacrifices as they grapple with diverse and contemporary security challenges plaguing the country. He promised that his administration will continue to do all within its power and resources to ensure that their welfare is adequately catered for. The President said he looked forward to a time when business concerns and service providers in the country would give special recognition and consideration for the distinguished citizens and support the veterans’ cause in any way they can through voluntary donations, employment opportunities and welfare support. He added, “As a government, we desire to improve the capability of our Armed Forces. I am glad that our efforts are yielding positive results already in boosting the morale of men and women of the Armed Forces. “We will continue to engage them in training and retraining to improve on their capacity to discharge their constitutional roles. Don Moen, gospel music star dead or alive?